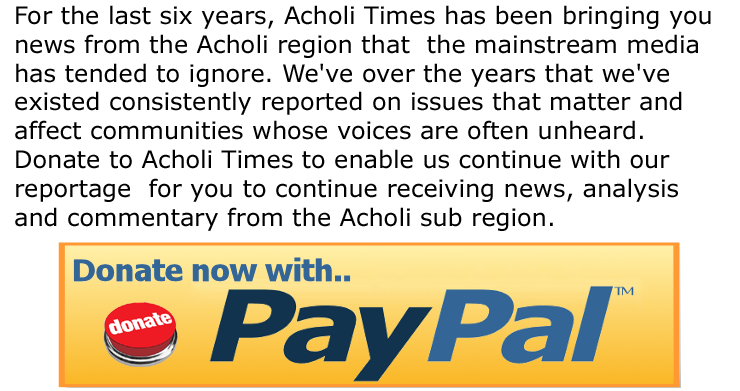 Acholi Times established in 2010 is a voice of the suffering people of northern Uganda.Newspapers and Magazines are an indispensable medium through which voices, advertisement and communication campaigns can be carried . Our mission is to be an alternative to the pro people’s suffering in Acholi and the international media who have instead turned to cheering and glossing over the neglect and abuse of the Acholi people. Acholitimes is as private ownership guarantees the independence of its editors, photographers and journalists, free from the influence of Government, shareholders or any political allegiance. Acholitimes is the only website of its kind in the world that reports on news stories unhindered and conducts serious investigative reporting in the public interest. We will consistently break stories and set the news agenda. The culture of freedom is reflected throughout the website, ensuring an open-minded and innovative approach to every aspect of publishing. entertainment on the people of Acholiland. We provide as diverse coverage as is possible. If you don’t flow along with the political tide, we still have the community ezines that could be the stepping-stone to you meeting and engaging with others from Acholiland. But if even that won’t do for you, then you might just be interested in our most comprehensive opinion polls and a discussion forum to ensure the highest level of interactivity. Acholitimes however is not only interested in informing, educating or entertaining you. We have got amazing business/advertising packages to help you sell your products, services or company image. You will not only be selling your business but identifying with the face of humanity that being the case put your money where your customers are! Acholitimes has used reasonable endeavours to ensure that material contained on this web site is correct at the time the relevant page was created, modified and published. no reliance should be made by any user on the material, but instead the user should check for confirmation with the originating or authorising Editors. and ACHOLI -Times, reserves the right at any time to make changes as it deems appropriate. Acholitimes provides external links as a service to users of its web site. In providing an external link ATO does not accept responsibility for or endorse the content or condition of any linked site.